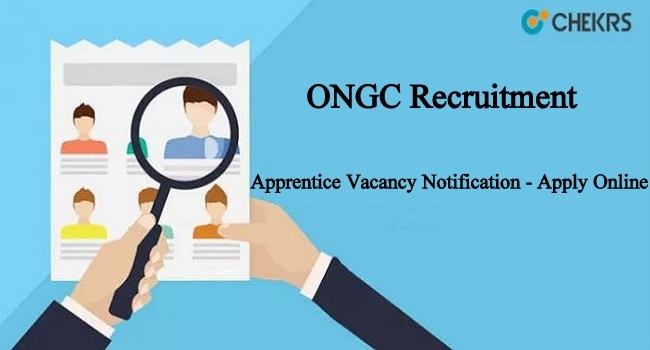 ONGC Apprentice Recruitment 2019: (ओएनजीसी भर्ती प्रशिक्षु रिक्तियों के लिए आवेदन) The Oil and Natural Gas Corporation Limited (ONGC) has now recently published ONGC Recruitment 2019 Notification for Apprentice 4014 Vacancies in various trades. Eligible and interested candidates can apply online for ONGC Apprentice Vacancy 2019 through official website www.ongcindia.com on or before the last date. The application form available dates are 14th March to 28th March 2019. Late submitted the application form will not be considered for further evaluation. For more details of ONGC Recruitment 2019 like pay scale, educational qualification, hiring process etc. are mention below. Candidates who are Physical Handicapped must apply for ONGC Vacancy 2019. In this article, we are giving all information related to ONGC Recruitment 2019 and more update about Latest Government Recruitment. तेल आणि नैसर्गिक वायू महामंडळ मर्यादित, अहमदाबाद नि प्रसिद्ध केलेल्या जाहिराती नुसार येथे विविध पदाच्या एकूण जागांसाठी अर्ज मागविण्यात येत आहेत. इच्छुक उमेदवारांनी अर्जाची नोंदणी दिनांक 28 मार्च 2019 पर्यंत करावे. अधिक माहिती साठी कृपया दिलेली PDF जाहिरात वाचावी. Eligible and interested candidates have to apply ONGC Apprentice Jobs 2019 in an online mode procedure through the official website on or before the last date which is 28th March 2019. Read the notification carefully before apply to ONGC Recruitment Jobs 2019 under various Locations for Persons with Disabilities (PWD) candidates. This is the great opportunity for the freshers who are looking jobs in the ONGC Department. Aspirants who are searching for Latest Government Jobs in Gujarat can apply for the current vacancy in ONGC Department. Candidates who are applying for ONGC Apprentice Recruitment 2019 must check the eligibility details before applying. Here we are providing the ONGC Recruitment 2019 eligibility criteria which include education, pay scale, selection process etc. Candidates who are going to apply for ONGC Ahmadabad Recruitment 2019 should pass the Degree/ITI/Diploma according to the post. The candidate should have attained the age of 14 years and should not have attained the age of 24 years as of March 2019. The monthly stipend will be paid as per the prescribed rates governed by the Apprenticeship Act. Short listing of candidates will be done based on the percentage of marks obtained in the basic prescribed qualifications as applicable to the respective trade. Applicants can apply for one trade only. Click on the notification link attached here. Read all the details of ONGC Apprentice Recruitment 2019. Take a copy of online application form for further uses. ITI Certificate & Mark sheet, if applicable. Cast (SC/ST/OBC) Certificate, if applicable. To receive more updates on ONGC Recruitment 2019, keep visiting our site www.jobs.chekrs.com. Here job aspirants can get the latest alert in concern to ONGC Vacancy. We will provide you with the upcoming details of ONGC Apprentice Notification. In the case of any query or review, your valuable comments are most welcome in the commenting section below and our team will get in touch with you shortly.